Conversion Rate Optimization is a process that cannot be mastered by following best practices from the internet. In this blog, we will share our CRO experts’ frameworks & practices that will help you master Conversion Rate Optimization. Goals can only be achieved if there is a clear idea on what we are doing here. What is going to be the final goal? These are the two questions that you need to seek answers for. Conversion Rate Optimization for a website is a chain of processes that brings in more number of visitors to make a decision or to perform an expected action on the webpage. Is it just about increased conversion rates? Not really. If you slash $1 on all the products that are listed in your eCommerce store, your conversion rates will shoot up. But, you will be running out of business in no time. 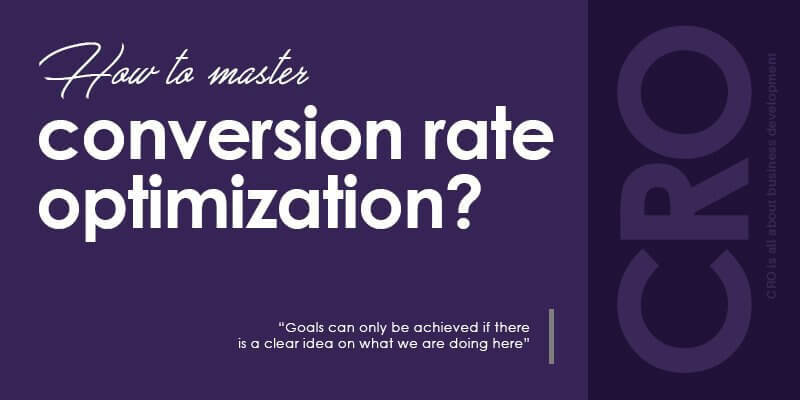 So the term “Conversion Optimization” can be confusing. You should NOT optimize for only conversion rates. The people who named it will perhaps hate the name that they gave to this process. If you are just starting up, SEO is a difficult growth hacking process since the competition is too high to compete with. Even Facebook ads & PPCs have become very expensive. And if you are selling a product that follows paid customer acquisition, it is very hard to find out relevant customers on the internet and to make them pay. Conversion Optimization is a trigger that is essential to boost your business growth. The USP of CRO- You can acquire customers with less expenditure- than your competitors to grow faster. 1. Make the change that you like or feel is a good idea on the home page. And you can keep hoping that the sales will double. 2. You should probably check out the pages within your website that causes the stagnation. Once the cause is figured out, you move forward to resolving the issue. You should be enthusiastic to understand your customers in a more informed manner. Why do they hesitate to make a purchase from you? You should definitely gather solid data to figure out what people are doing in your website. To be honest, there is no other easy way to approach this. You can market your eShop in a better way if the communications and discounts that you offer are in accordance with what the market is demanding. But, most of the companies are still behind the first approach. They keep doing the same thing, again and again. They waste a lot of time on tweaking their homepages just to increase sales and most of the time wasted on this cannot be gained back. Why Big Companies Resist CRO? The resistance from big eCommerce players for CRO is mainly due to ignorance and most of it is due to the resistance that they have for a change. Companies that oppose CRO will eventually be sucked in by the vacuum called “competition”. Now, How To Become A Great Optimizer? Keep your business away from your opinions. One thing that all of us would agree upon is that, opinions do not generate revenue. You don’t buy from your website and you are not the customer of your eShop. Usually customers that land on your website belong to different walks of life. You cannot align your business goals with your opinions. You should probably think of ways to understand your customers and make necessary changes for them in your website and not based on your opinions. Nobody can be expected to know what will work- Assume a person who proclaims to know what will work for your business, they are probably lying. Nobody knows what will make a business successful. If you knew what will work for your business, you wouldn’t be reading this blog and you would rather be a multi millionaire. No Harry Potter magic wands for higher conversion rates- There is nothing called the best home page design. There can be nothing that keeps working out always. Agencies that tell you “Websites that always win” is probably behind your money. The Commerce Shop can show you tests where these “best” practices have failed when compared to our process driven optimization techniques. One you agree upon these facts, it is much easier to go ahead. Stop making guesses, refrain from liking your own ideas so much and please alienate yourself from opinions. First thing that you have to do to make your business successful is by not making random guesses. Focus more on UNDERSTANDING what is happening and also ANALYSE why this is happening. Setting up goals—> Gathering data—> Scrutinize data—> Converting data into deep insights—> Substantiate insights into proven hypotheses—> Test the hypotheses—> Gather more data from the test results—> Back in track of data analysis. And round and round. Now, if you are an ardent eCommerce owner who is looking forward to double your conversion rates, it is high time that you get in touch with the CRO experts at TheCommerceshop.